100 Ladies Pokie Review - Play today! This nice little slot game from IGT will take you instantly into the world of bugs. Match them correctly, and some grand prizes are waiting for you. The happy theme, music and sound effects should get you in the right mood for playing, and it won’t take long before you will want to spin again to see whether this is your lucky night. Just imagine the possibilities available when 100 pay lines are active, and the tens of winning combinations start to appear on the reels. 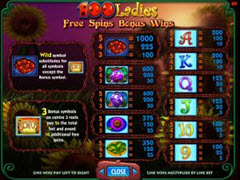 Playing 100 Ladies slot game is simple, you first have to choose the number of lines you want to activate (up to 100) and the bet per line. Get things pumped up by activating all 100 lines, and this should get you the maximum action. There are several features like auto spin that should help you push things forward and continue playing the game on autopilot. This game can bring a lot of joy to both casual players and to high rollers as the bet levels can go up significantly. The game is all about offering you good time and joy. You can tell that right after the game loads. Everything is vividly colored, and a happy tune starts every time you spin the reels. The right combination of bugs, leafs, A, K, Q, J, 9 or 10 should bring you the satisfaction you need and an impressive payout. Don’t let the game eat your credits too fast as there are 100 lines you can activate. This means that a proper bankroll management should be taken into consideration when playing 100 Ladies. Playing the slots is all about the bonus features that can always bring some significant payouts. The first thing worth mentioning at 100 Ladies is the free spin feature. You must have three bonus symbols on the three center reels, and they will bring you ten free spins. These can get retriggered up to a total of 255 spins, and you can get an even higher payout. Wild symbols are also very common, and it will substitute exactly the symbols you need to have those winning combinations you are longing for. These can get stacked wilds, and this means that you get more opportunities as they will stick to the reels once you get them, and you can even utilize them during the moments when the free spins feature is trigger. 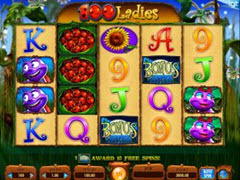 If you are looking for a video slot game that should be able to cheer you up, then 100 Ladies is the right choice. There are some high quality graphic waiting for you and this insects themed video slot game is always a great option and why not just give it a try.